Sister Gwynette Proctor is a Sister of Notre Dame de Namur who serves as Director of the Office of Black Catholic Ministries in the Archdiocese of Baltimore. 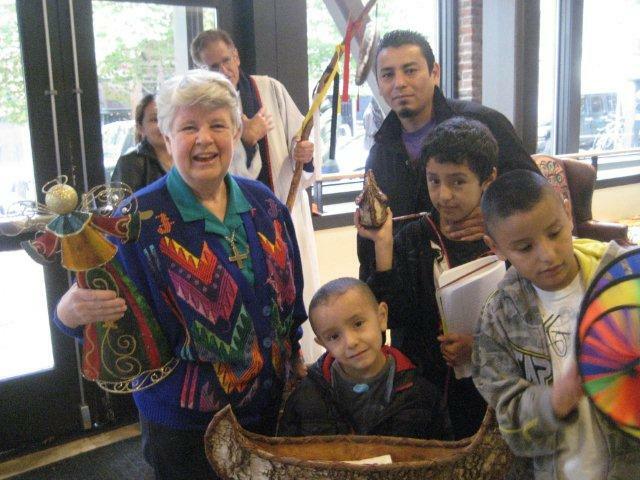 Her ministry focuses on evangelization, leadership development and cultural competence training and education. She offers in-service workshops in teaching tolerance for teachers and administrators in schools and parishes. Sr. Gwynette works with Archdiocesan agencies to create more diversity in these communities in the greater Baltimore area. In 1984, Sr. Gwynette saw a pressing need in the city of Baltimore. She envisioned and founded a program to reach out to young Black lives, in collaboration with the Catholic Archdiocese in Baltimore. Harambee Catholic Youth Organization is a network of 16 Black parishes which work together and share resources for spiritual, cultural and leadership development of youth. Sr. Gwynette describes the need, purpose and goals of this program. At a gathering of 100 representatives from the Black Catholic Parishes in 1984, the Harambee Catholic Youth Organization began its outreach. The group realized that the multiple challenges facing our young people could not be adequately addressed by one parish alone. The gathering decided that together, they could have a greater influence on and increased resources to support our young. Harambee, which in Swahili means “Let’s All Work Together,” is a network of 16 Black Catholic Parishes and offers programs that center on three aspects of outreach to and with Black Catholic youth: Spiritual Enrichment, Cultural Enrichment, and Leadership Development. Spiritual enrichment and Christian formation are the foundations that inspire our children, youth and adults to trust in a good God that can and will carry them through difficult times. One hundred youth gather for prayer services and Days of Reflection. Another 70 young adults from ten different parishes participate in “Into the Woods with Christ,” the annual retreat on a camping trip to Swallow Falls State Park. Harambee has also a choir, led by youth and composed of over 50 African American youth. It hosts a regional Youth Revival for 150 young people from neighboring states who lift their voices in prayer and song in praise of our good God acting in and through them. Cultural enrichment keeps our youth connected to the achievements and legacy of the ancestors. Every culture has a language and a perspective that gives insight into the human condition. African and African American culture helps Black youth to “know who they are and whose they are.” Exploring African roots begins with an awareness of the divine and stories of a people who survived beyond slave ships, shackles and racism. Bishop John Ricard with participants. Each year the group engages in the “Harambee Freedom Ride.” This cultural emersion trip provides young participants with time away from their homes to be one with God, their peers and the historical, cultural and spiritual monuments and memories of African American leaders of our Church and throughout the country. At the conclusion of this experience, Bishop John Ricard leads a commissioning service at the Mother of Africa Chapel in Washington, D.C. Leadership Development focuses on expanding and enhancing leadership skills among African American youth. This outreach in the program facilitates opportunities for youth to develop leadership, organizational, communication and peer ministry skills for service in the Church, school and community. Young people gain the spiritual and cultural strength to heal the scars of racism, combat the many negative societal challenges and strive to break the cycles of poverty that plague our communities of color in the city of Baltimore. Notre Dame in Kenya celebrates a Golden Jubilee (1965-2015), a time of gratitude for the gifts of fifty years and hope for a new future! 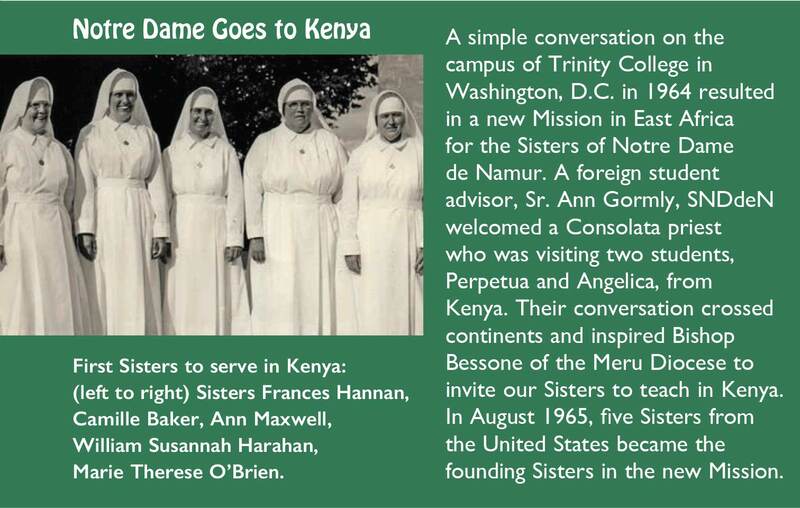 When the Sisters of Notre Dame de Namur (SNDdeN) arrived in Kenya in 1965, education was considered a priority for the newly independent nation. Full of hopeful expectation, the country faced dramatic changes. In educating the young, the Sisters contributed much to the changing environment in the early years and throughout these fifty years. Today in 2015, Kenya has developed enormously and is becoming gradually a developed country, despite many internal problems. Aware of increasing violence, based on discrimination within our global reality, the Sisters in the Kenya Unit realise the need to facilitate education for change. Technology has led to growth in many areas, even in the financial realm. However, the economic gap between the rich and those living in poverty increases every day. As educators, the Sisters are experiencing a call for personal, communal and societal transformation, leading to tolerance, justice and peace. During the Church’s Year of Consecrated Life, they are beginning the next chapter of life with the entire Notre Dame Congregation. Multiple blessings emanate from a religious congregation which is international. During Notre Dame’s fifty-years in Kenya, Sisters from Congo, Japan, Nigeria, United Kingdom (UK), and USA have served in various ministries for extended periods of time. Presently, twenty-one professed Sisters carry on the legacy of the Kenya Unit. Fourteen Sisters are Kenyans. Inspired by the spirit of St. Julie, alive in the communities and ministries of Sisters, ten young women are currently discerning entrance into our Congregation. Rooted in Kenyan life, the Sisters yearn for ministries on Notre Dame owned land. Today Malava, in Kakamega Diocese, has a flourishing school opened in January 2010 with a small class of 3 year olds who are now in Class 3. The school continues to grow in modern, well-equipped classrooms. A new building is almost ready to accommodate a full elementary school with classes from Grades 1 to 8. The Sisters’ ministries cross the whole range of education, not only in schools but also in the wider sense of being with people as they strive for self-reliance. A strong focus on justice and peace calls the Sisters to greater awareness of our world in crisis and to action for change in a new era. As Kenya still reels from the Garissa University attack, the Sisters look forward to acting on principles of justice and peace in their ministries among the people and in their own lives. 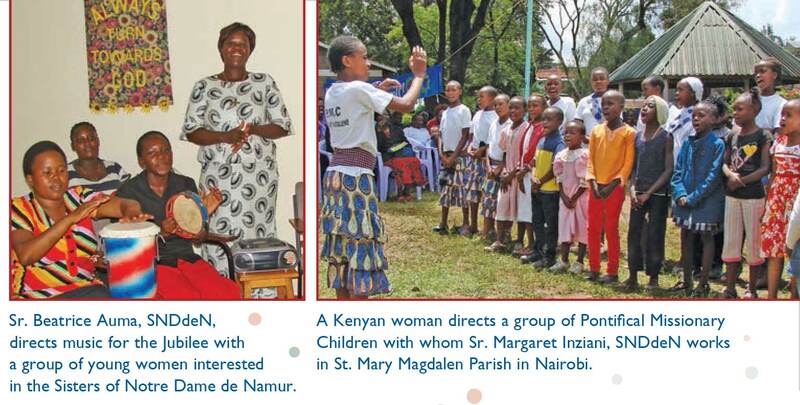 The Sisters of Notre Dame de Namur have always collaborated with the Church, religious congregations and local communities in their ministries in Kenya. The first five Sisters brought St. Julie Billiart’s living charism by proclaiming the goodness of God in small communities and expanding ministries. They began teaching at St. Mary’s Girls’ Secondary School and St. Lawrence’s Teacher Training College in Egoji. Each year, more Sisters arrived. Both primary and secondary teachers-in-training profited from the Sisters’ expertise and experience in several places, including Eregi Teachers’ Training College in Western Kenya and Kenyatta University College near Nairobi. In catechetical teams and as parish ministers, the Sisters helped to teach new methods in religious education at all levels across the country. 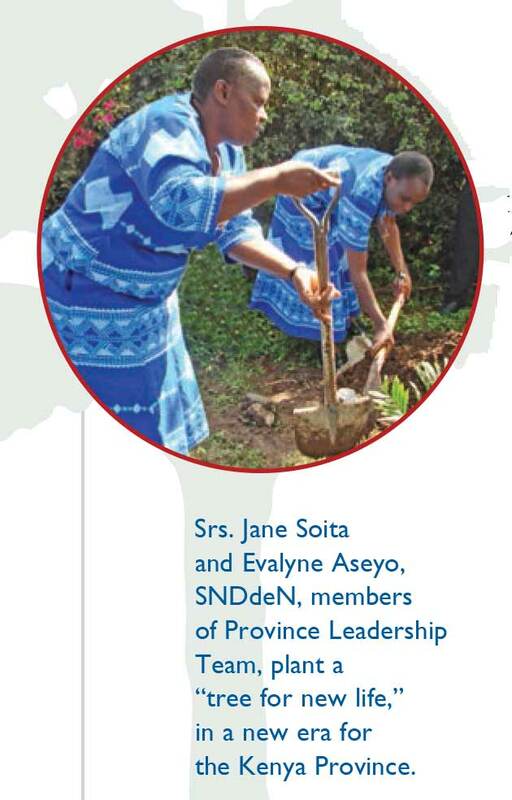 The Sisters opened schools in the dioceses of Meru, Kakamega and Lodwar. They knew that the schools, once established, would be given to local Religious Congregations. Bishop Sulumeti Girls’ Secondary School in Kakamega is one of these schools. At the invitation of the Bishop, Sisters spent twelve years opening and grounding students in a solid education. Recently, one SNDdeN spent five years on the staff of this school which educates today over 900 young women. Two alumnae are Notre Dame Sisters who continue to spread God’s goodness. From the beginning, the Sisters networked closely with local Congregations, and helped to establish the Association of Sisterhoods of Kenya. 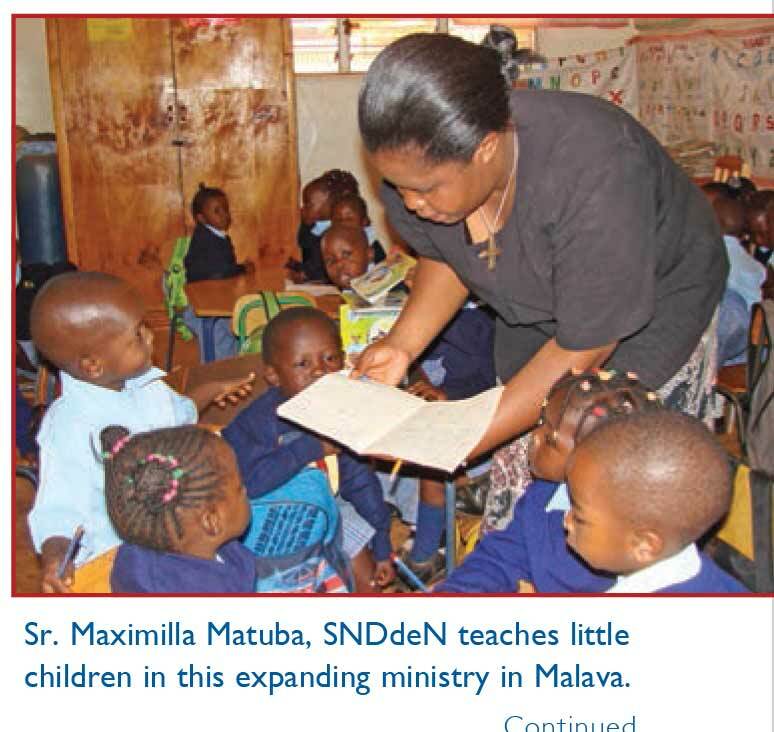 SNDdeN contributed to formation programs for seminarians and other women religious. 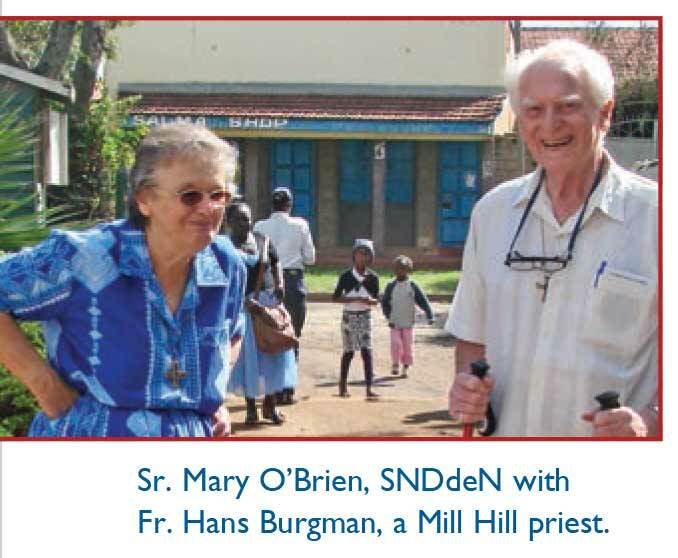 Serving in very poor areas of Nairobi and Kisumu, the Sisters collaborated with the Mill Hill Fathers in assisting local communities to move towards a better quality of life. In different towns /cities, our Sisters have educated disabled children. Several Sisters joined the staff at St. Lucy’s School for the Blind at Egoji. Others worked with children living with disabilities in the Challenge Program in Nairobi. For ten years, St. Julie’s Centre for Disabled Children in Malava gave needed support for educating those in need. Today, the fruits of this ministry remain visible. Our Sisters are not strangers to life in the desert. One Sister became the headmistress in Marsabit Girls’ Secondary School, a new and struggling school. Three Sisters went to Lodwar where they founded a Girls’ Primary School. One of them travelled the desert roads throughout Turkana strengthening religious education in the diocese and in helping the women become more self-sufficient. Two Kenyan Sisters first met our Sisters in Lodwar. The Sisters hope that St. Julie’s daughters will again minister in the future among the Turkana people. Life in Mission relies on continuing education of the Sisters since the beginning of the Kenya Unit. Through study, the Sisters become more caring, professional teachers, knowledgeable and astute stewards of resources, effective communicators, versatile and compassionate social ministers. Education prepares Sisters for the future and moves systems to action for transformation in society and change in our Church and world. The original academy outgrew four campuses in Boston: Lancaster Street, Berkeley Street, the Fenway [now Emmanuel College] and Granby Street. In 1954, the Boston Academy merged with Notre Dame Academy (NDA) in the Roxbury neighborhood of Boston and in 1965,the school relocated to Hingham, Massachusetts, 15 miles south of Boston. 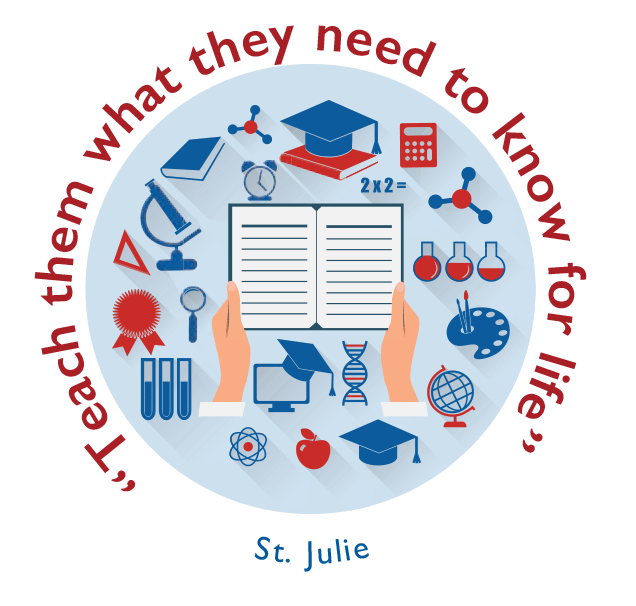 While locations changed through the years, the purpose and ideals of the school continue in programs always focused on St. Julie’s mandate: “Teach them what they need to know for life.” Academic excellence and faith formation are primary goals for all students. Graduates are well-prepared for further study at college/university level and are also well-grounded for life in faith and ethics. Throughout the years, the Sisters with lay faculty and administrators adapted the curriculum to meet the needs of the day. Early in the school’s history, when men dominated the business arena, the Academy offered business courses and trained young women to work in office settings. In years when science courses were not considered the norm for girls, the Academy offered biology, chemistry and physics. The science curriculum now includes environmental science courses as well as engineering and robotics. Students work with local environmental agencies to identify and register vernal pools for protection. A vegetable garden, planted on campus last year by faculty and students, yields produce for the school’s dining service. In the near future, the students and faculty hope to share vegetables with local food pantries. In the 1960s, with the new directions in the Church after the Second Vatican Council, the Academy updated the religion curriculum to include social justice courses with a service component and encouraged students to question and seek the truth. Alumnae from every generation realize that the Sisters taught them for generations to find their voice as women on major social issues. Today, NDA students focus on global education and the care of the earth. Language study is still a critical element in the curriculum, with programs in French, Spanish, Latin, and also Mandarin Chinese and American Sign Language. Multi-cultural travel experiences to England, France, Spain, Italy, Costa Rica, China and various parts of the United States include a service and learning component for the students. The Academy also collaborates in an international student exchange program with Notre Dame High School in Plymouth, England. 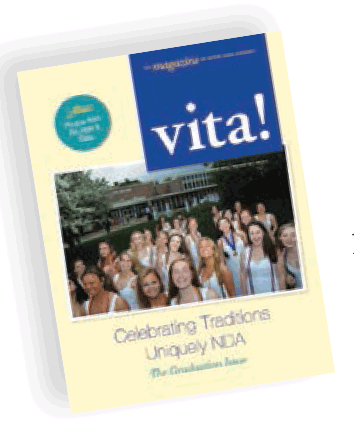 NDA’s greatest resource is its faculty and staff. Well-educated and committed to the Mission of the Sisters of Notre Dame de Namur, these women and men inspire students to stretch beyond who they are now to reach new horizons. They model life-long learning and community involvement. 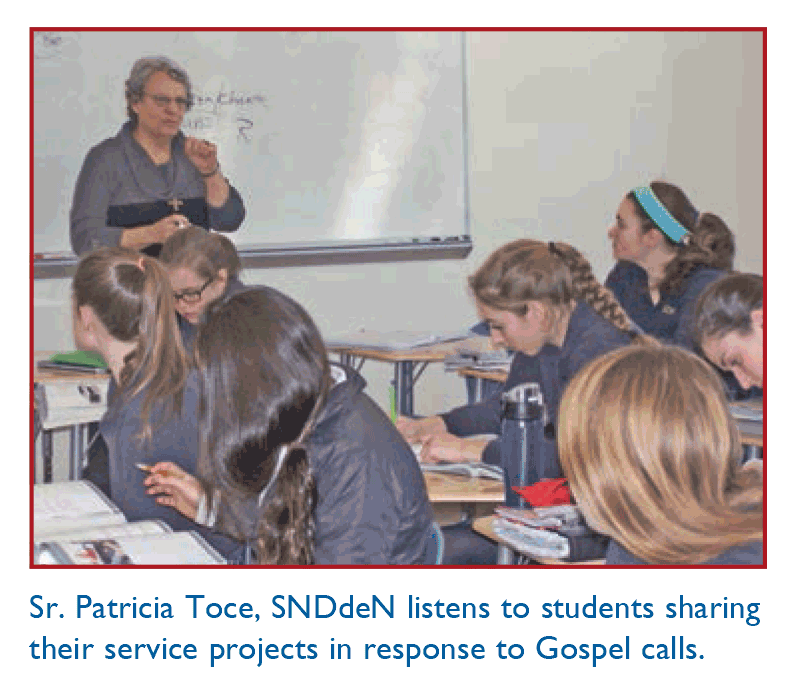 Service is a way of life at NDA where faculty and staff work side by side with the girls in all the service projects. Current and prospective parents visiting the school recognize the comfortable relationship in the classes between teachers and students. Many alumnae have been and are today faculty, staff and administrators at Notre Dame Academy, as well as in other ND ministries. Also, many young women educated at these different campuses of Notre Dame Academy have entered the Sisters of Notre Dame de Namur, to carry forward the Gospel Mission in academies, parish schools, centers and to stand with the poor in varied ministries in the US and across borders, cultures and generations. 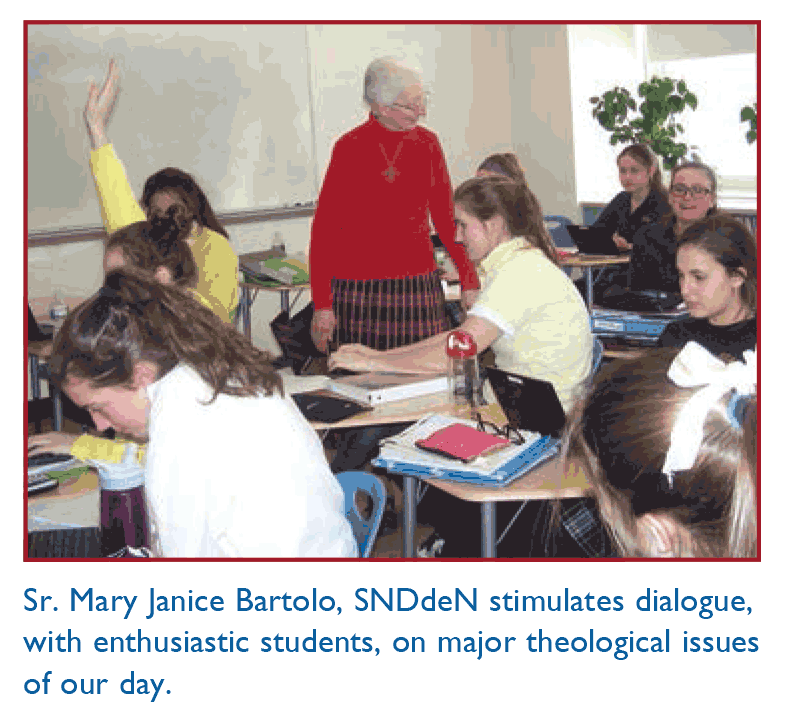 Faithful to making known God’s goodness, the NDA community continues to thrive and to educate a new generation of young women to proclaim the Gospel in their daily lives and for years into the future. Invited by the Jesuit missionary, Fr. De Smet, SJ, the Sisters of Notre Dame de Namur arrived from Belgium in the Pacific Northwest in 1844. ” In St. Paul, Oregon, the Sisters established a school for the daughters of the fur traders and Native Americans or mixed-blood women. The Sisters also prepared local Indian women and fur traders’ wives to receive the sacraments. The offered instruction in French and also acquired some knowledge of the Chinook language. From Good Works, March 2015, pp. 18-19. Excepts reprinted with permission.